How do I remove old kernel versions to clean up the boot menu? Every time I install a new Linux kernel, it gets left in the grub_config, making the boot menu longer each time. I know I can manually search through the installed packages and remove them. Does Ubuntu provide any easier way to clean them up or keep them from showing in the boot list? The latest versions of Grub2 installed in Ubuntu automatically display the latest kernel and hides the older kernels that you may have installed. 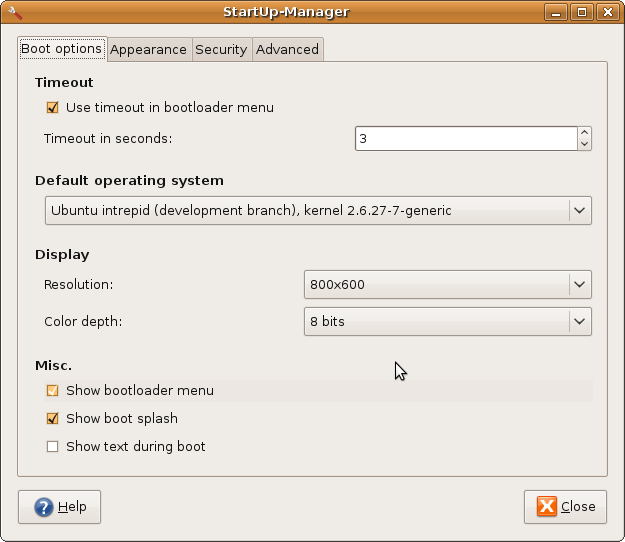 If you do not see your grub - then remember to press Shift whilst booting. As you can see, only the latest kernel is displayed. If you select the option shown (press Enter) then all the old kernels become visible and available to boot from. First boot with the latest available kernel. There are a number of ways to delete old kernels. Personally, I wouldn't touch Computer Janitor since this is acknowledged to break your computer with its suggestions. search for linux-image, right-click a kernel and choose complete removal and finally click the Apply button to delete the kernel. Repeat the search but this time for linux-header - you can delete the associated headers for the kernel image chosen previously. Synaptic though will not attempt to verify what you are trying to remove... you could inadvertently delete your newest kernel - or even delete all of your kernels via this tool leaving you with an unbootable Ubuntu!. Remember the result and the number - make sure you don't delete the corresponding image or header. My recommendation is to keep at least two or preferably three kernels including the latest. The reason for the recommendation is that you will have at least one/two other kernels to boot with, if for what-ever reason the latest kernel you are unable to boot with or introducing a regressed capability such as broken wireless. DO NOT REMOVE THIS KERNEL! Next, type the command below to view/list all installed kernels on your system. Find all the kernels that lower than your current kernel. When you know which kernel to remove, continue below to remove it. Run the commands below to remove the kernel you selected. altogether, sed -n '/'`uname -r`'/q;p' is print the lines until it matches with the current kernel name. If you're paranoid (like me), you can make the last part xargs echo sudo apt-get -y purge so that the command to purge the old kernels is printed, then you can check that nothing unexpected is included before you run it. Removing Entries from Grub 2 Entries should be removed by editing or removing files in the /etc/grub.d folder. The /boot/grub/grub.cfg file is read-only and should not normally require editing. If you are not sure of the kernel you are currently using, in a terminal type uname -r.
Kernels removed via APT (Synaptic, "apt-get remove", etc.) will automatically update grub.cfg and no user action is required. A great tool for removing kernels (and menu entries) is Ubuntu-Tweak, a safe and easy-to-use GUI app. Ubuntu-Tweak will be available under Applications > System Tools. 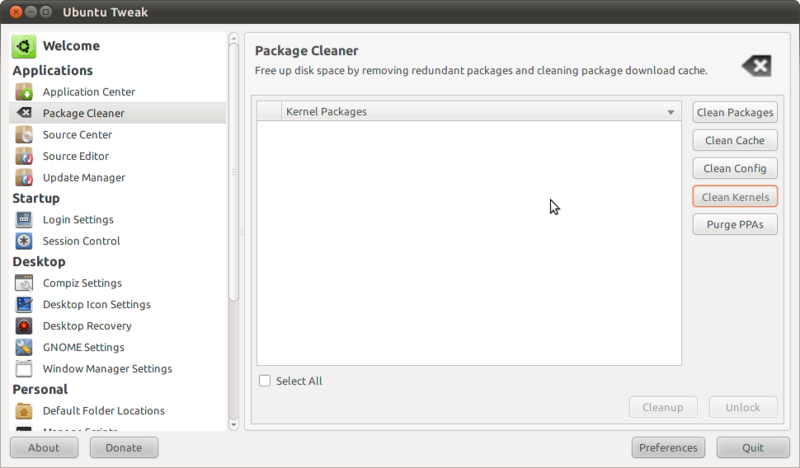 Select "Package Cleaner" on the left and "Clean Kernel" from the right panel. Press the "Unlock" button at the lower right, enter your password. Select from the displayed list the kernel images and headers you wish to remove. The kernel in use is not listed. Press the "Cleanup" button at the lower right to remove the selected kernel images and headers. Other Operating Systems which have been removed from the computer will also be removed from the menu once "update-grub" is run as root. Note: After kernel updates a new entry is added to the GRUB menu.You can remove the older one if you want.However, most experienced users will advise you to keep at least one spare entry in case something goes wrong with an upgrade and you need to boot an older kernel version for troubleshooting purposes. You see in the second screenshot you can select how many kernels to show? I generally just keep it on 1, but when I get a kernel upgrade I always change it to 2 before restarting so I can select the older kernel if the new kernel has problems with my hardware. Once I know the new kernel is working well I change it back to 1. Update: purge-old-kernels is deprecated nowadays. I made a script to purge kernels even in tricky conditions. It is called linux-purge and you can find it here. If you just want to purge the kernels (and the related packages) that are older than the currently used kernel, when system is not broken, you could use this script. There is also an Ubuntu documentation page that I have contributed to concerning removing old kernels here. You can follow the Using the "unattended-upgrades" package section of Automatic Security Updates article on Ubuntu Wiki to perform this. 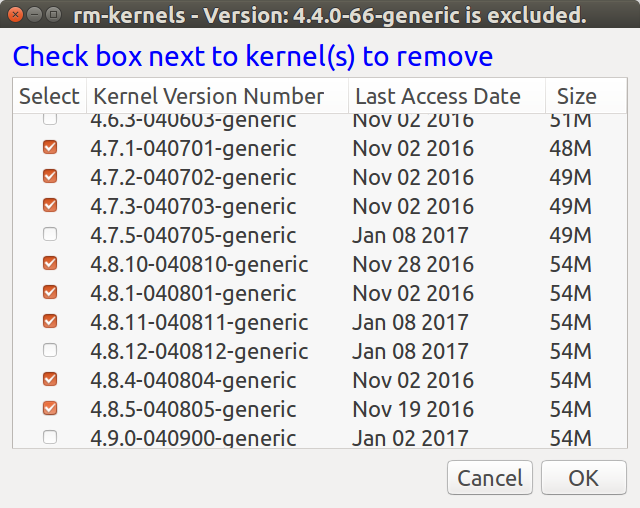 to automatically remove old packages, including kernels. in the "NeverAutoRemove" section of the file /etc/apt/apt.conf.d/01autoremove. which would check for any unused packages and remove them if necessary. This is great for those libraries and dependency packages that are no longer needed byt any app installed. Computer Janitor can clean up old kernels and I believe is installed by default in Ubuntu (but not Kubuntu). GRUB 1, if you're using that, has an option in /boot/grub/menu.lst to specify how many kernels it should show at a maximum. GRUB 2, as far as I can tell, does not. You can then remove them one by one or together, just make sure to keep the most recent. There are also some handy commands and scripts to automate the removal. 0 upgraded, 0 newly installed, 10 to remove and 1 not upgraded. After this operation, 671 MB disk space will be freed. In order to remove older Linux image kernels, first boot in the kernel you want to keep. 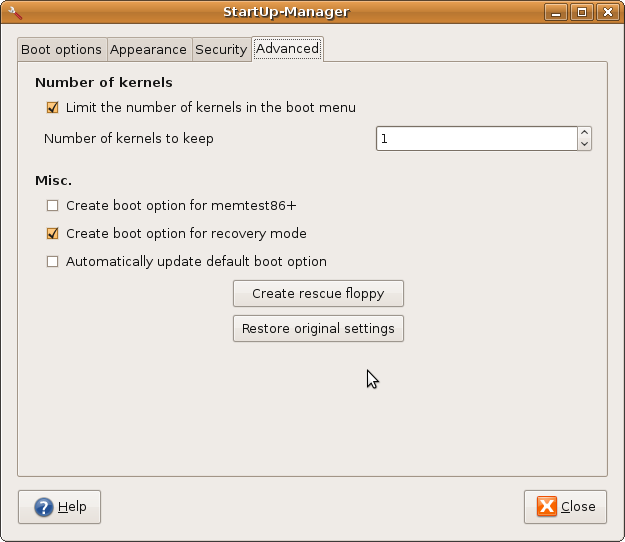 You can also check the kernel version using command uname -r so that you don't remove the wrong one by mistake. Now go to synaptic package manager and search for linux-image and remove the older versions except the one shown by upper command. Generally I prefer to go with the latest one. Now when you restart you'll see a more clean grub menu. click package cleaner and clean kernels. it does not show the currently used kernel so you will always be safe. Personally, I like using Synaptic. It makes me feel more secure about what's going on. The only app I've used that has an option to remove old kernels is Ubuntu Tweak. You can uninstall the old kernels (linux-image-... packages) using Synaptic, and that will remove them from the boot menu. Take care not to remove the running kernel (you can check its version with uname -r). Bear in mind that having a one or two older versions can help you troubleshoot, should something go wrong. Alternatively, you can edit/remove the entries manually (gksu gedit /boot/grub/grub.cfg), but they will be re-generated when you update to a newer kernel. If you are thinking about removing recovery mode options - don't. They can come in handy if you break something which prevents you from booting. This is a pure command line solution. Examine the list. Make sure the the kernel versions you want to keep are not part of the list. Use the command uname -r to see the version of the currently running kernel. If you are happy with the results you can use apt-get to remove the packages. The advantage of this answer is native Ubuntu Bash is used without installing third-party applications. Users of custom kernels who didn't use apt or dpkg can change this bash script to suit their needs. This answer is based on (How to selectively purge old kernels all at once). As the title indicates the current kernel you booted with cannot be removed and isn't included in the list. The size reported is how much will be saved in /boot directory. More is saved on your disk because kernel binaries reside in other areas too. July 27, 2017 note: The directories /usr/src/*kernel_version* and /lib/modules/*kernel_version* are now included as well. The Modified Date is discovered using the stat command. On my system that date is "touched" every time the kernel is booted using this (How do you find out when a specific kernel version was last booted?) cron reboot script. However, on your system the date will be the kernel release date, not the last time you booted it. 0 upgraded, 0 newly installed, 24 to remove and 2 not upgraded. After this operation, 2,330 MB disk space will be freed. # DATE: Mar 10, 2017. Modified Jul 28, 2017. # NOTE: Will not delete current kernel. #       First time for `du` 34 seconds. #       Second time for `du` 1 second. # PARM: If any parm 1 passed use REAL kernel size, else use estimated size. #       By default `du` is not used and estimated size is displayed. zenity --error --text "root access required. Use: sudo rm-kernels"
if [[ $# -ne 0 ]] ; then    # Was a parameter passed? # remains on disk for specific version with no -generic or -lowlatency below. rm-kernels-server is the server version to selectively delete kernels all at once. Instead of a GUI (graphical) dialog box a text-based dialog box is used to select kernels to purge. Dialog is in the default Ubuntu Desktop installation but not in Ubuntu Server. #       Non-GUI, text based interface for server distro's. echo "root access required. Use: sudo rm-kernels-server"
item_list=() # Deviate from rm-kernels here. NOTE: In the call to dialog the directive --ascii-lines is passed to replace line-draw extended character set (which ssh doesn't like) with "+-----+" for drawing boxes. If you do not like this appearance you can use the --no-lines directive for no box at all. The calculated size of each kernel was taken from /boot/*kernel_version* which were 5 files totaling ~50 MB. The formula has changed to include the files in /usr/src/*kernel_version* and /lib/modules/*kernel_version*. The calculated size for each kernel is now ~400 MB. The above code for rm-kernels and rm-kernels-server has been updated. However, the sample screens above do not reflect these changes yet. The default is to estimate the size of files for linux-headers at 125 MB and linux-image at 220 MB because du can be painfully slow unless files are in cache. To get the real size using du pass any parameter to the script. The total of all kernel sizes (excluding the current running version which cannot be removed) is now show in the title bar. The dialog box used to display each Kernel's Last Access Date. This date can get mass overwritten for all kernels during backup or similar operations. The dialog box now shows the Modified Date instead. However, this will miss packages that are still recommended by other packages, and the -R/--without-recommends argument does not resolve this problem. dselect after switching sort mode with 'o' will show all obsolete packages including the ones aptitude misses, but some people don't like using it. The accepted answer using sed to remove older kernels permanently has some flaws, if someone has not rebooted the computer after upgrading kernel the command will remove the newer kernel too. dpkg --compare-versions "$ker_rel" lt "$cur_rel" && sudo apt-get remove "$kernel"
If you have any version that is newer than the current one this will give you a warning to restart you computer first. Also note that the older kernels are preserved due to a good reason which is if you somehow mess up your current kernel making your system unstable then you should be able to boot into any older kernel. 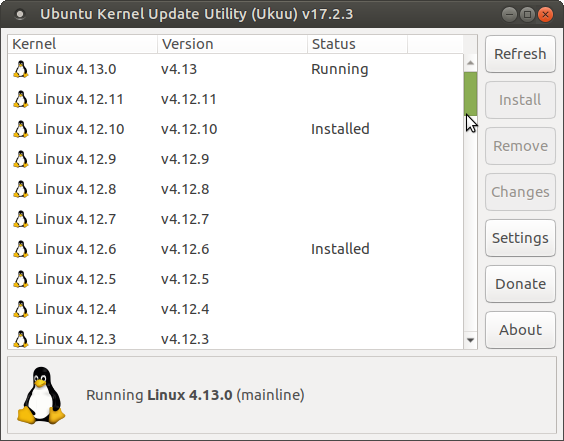 You can use ukuu - it's all GUI - to update and delete old Kernels. Works for me! Just remember leave the last 2 installed and obviously the 'running' kernel. You can also set ukuu to only show mainline releases, even RC kernels, hide point releases. here is a rough outline of what I did, careful as I am no expert in linux, be sure you know what you are doing and have backed up any files you are modifying. this will stop form auto adding all the linux entries into the grub boot menu. paste them into 40_custom, and then save it. Install the synaptic package manager and go down to the filters tab (I think filters, if not try all 5) and select "local". This will show you orphaned packages on your system, such as the kernels. After you uninstall them, run update-grub. That command updates the list of boot options for grub. If this fails, you can always try apt-get remove linux-image-version-generic. Based on a previous answer by David Kemp, the following script will purge all headers and images except for the last 2 versions. I use this to keep desktop's boot volumes relatively clean, but in a server situation you'd probably want to expand the logic and write some additional scripting to maintain a list of the last X kernels the server has booted. Adjust the list of kernel versions to fit. Try this. Run it as root. Pass, as a command line argument, the number of most recent kernels you want to preserve. # this command gives the list of all packages EXCEPT for the latest kernel. If you want [AND AT YOUR OWN RISK], you can add a -y (or a force flag) to the apt-get command and make it non-interactive. I'm using a KDE desktop, and the easiest option I found was using the kde-config-grub2 application as suggested here: https://www.kubuntuforums.net/showthread.php?58075-remove-old-linux-versions (which I already had installed for setting background image, default boot option, and the like). Next to the drop-down box where you can choose the default entry, there is a "Remove Old Entries" button. Clicking this button presents you with a list of all installed kernels and you can select which ones to remove. When you apply the changes it will use dpkg to actually remove them from the system as well as the GRUB menu. as root, and the job will be done. I have a script for this that does not need very fancy string parsing. Not the answer you're looking for? Browse other questions tagged grub2 kernel cleanup or ask your own question. How to remove old Linux kernel modules »tp_smapi«? How can I remove old linux-images when installing new kernel updates? 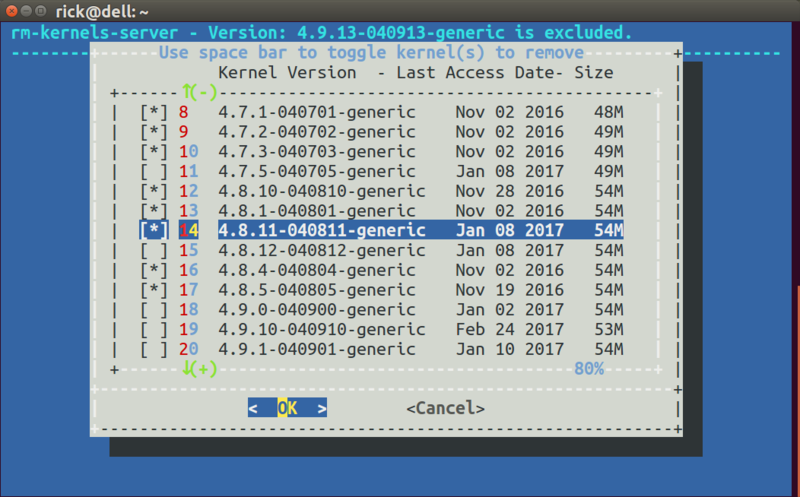 How to remove kernels from previous release? How do you clean up your GRUB 2 boot menu? Is it possible that I have more than one Linux kernel installed? How to “clean” previous kernels after update? How to remove old kernel versions automatically? Is it safe to remove extra GRUB2 entries from updated Kernel versions? How to modify GRUB boot menu? How to make Aptitude clean up old kernels?